I’ve heard a lot of horror stories out there about Kickstarter action figures. Most haven’t even got off the ground. 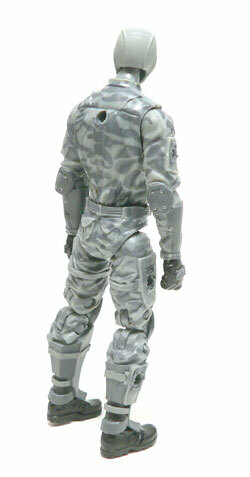 One that did, had a couple little bumps along the way, and is no shipped is the Marauder Task Force figure. 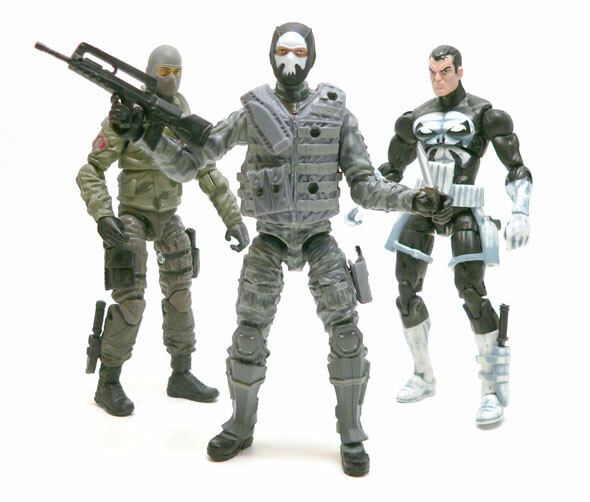 This project was helmed by the folks that bring us all those cool weapons for 3.75″ figures. I’ve covered some of those before. (Here and Here.) Also working on the project was Boss Fight Studios. So this will give us a sneak peek at what to expect from their Kickstarter. I only picked up one of these at the time. I don’t remember why. I just did. I think I knew the Boss Fight one was coming soon after. Staying true to what I like a I picked the grey urban camo trooper. I wanted an army builder head so this was perfect for me. Actually add a little camo to that head and you have a pretty good base for a vintage style Firefly. The basic figure is just that. A dude in urban gray camo fatigues. Well, just not fatigues. This guys has some armor on already. Forearm and shin guards will help toughen those areas up for a fight. Knee and elbow pads will protect those areas. The thing that kills me on these all have little dabs of silver for rivets. And it is applied really well. The underlying camo looks great. I actually like the fact that it isn’t as contrasty as some of the Joe camo is. This is subtle and pulls of the effect well. The zipper on the on front is silver and doesn’t look sloppy at all. The grey on the head seems a little different color, honestly I like the difference. I doubt that one manufacturer would have made all of the gear so it makes sense. In case you are wondering. The black skull head was a Kickstarter bonus that isn’t available. There are other versions, just not that one. I actually prefer the grey one, but your mileage may vary. In addition to the armor, there are some other hardened points on the uniform. Both biceps, thighs, and shins have hole for an accessory. but around that hole is sculpted to help it look like an attachment point. 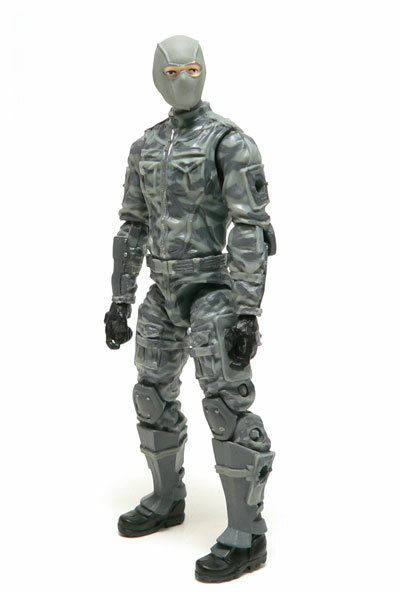 The overall look of this figure is modern military, but maybe add a couple years. It looks a bit into the future, but just a little. Considering this is how most films and such look these days, I think that is perfect. Where this guy really shines is the accessories. This figures were made with cusomizers in mind and there is a lot of options. Now the pack out I got with mine included basic stuff, but a ton of it. 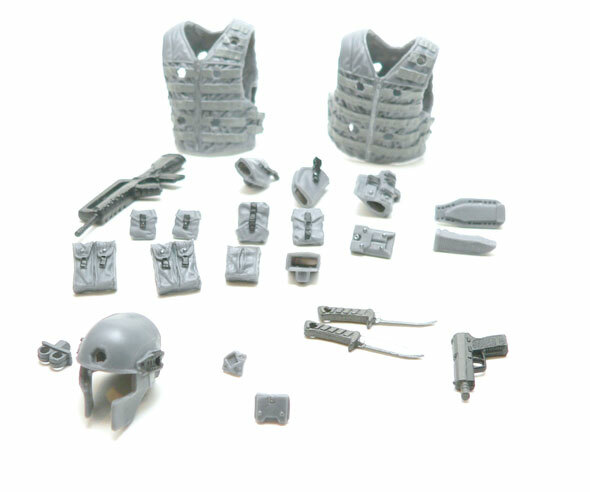 The main items are the two tactical vests and a helmet that looks like a cross between a Spartan warrior helmet and a modern army one. Now here’s where the options start. The helmet for example has three attachment points One on each side and one on the forehead. Now I didn’t get any of the lights, goggles, or mics that I’m sure will be made to plug into them. What I did get was a little tiny plug for the front hole that makes it look like an empty mount and covers the hole. This thing is tiny, to borrow from the What’s On Joe Mind? Podcast, this thing is prelost. Seriously, I fumbled it when I was trying to put it in and it landed on the floor. It took some searching with a bright light to find. The vests are similar. There are a number of holes to plug stuff. Five on the front and five on the back. There is two small pegs on each side to close them up. They were a bit harder to get them sealed up. Once I did, they seemed to hold really well. The vests are great looking versions of MOLLE tactical vest. Now the differences between the are a bit subtle. One seems to fit a bit tighter with the collar up higher. The other seems like it is for a slightly bigger figure. They do not have the hole for the Joe backpacks pre-made. 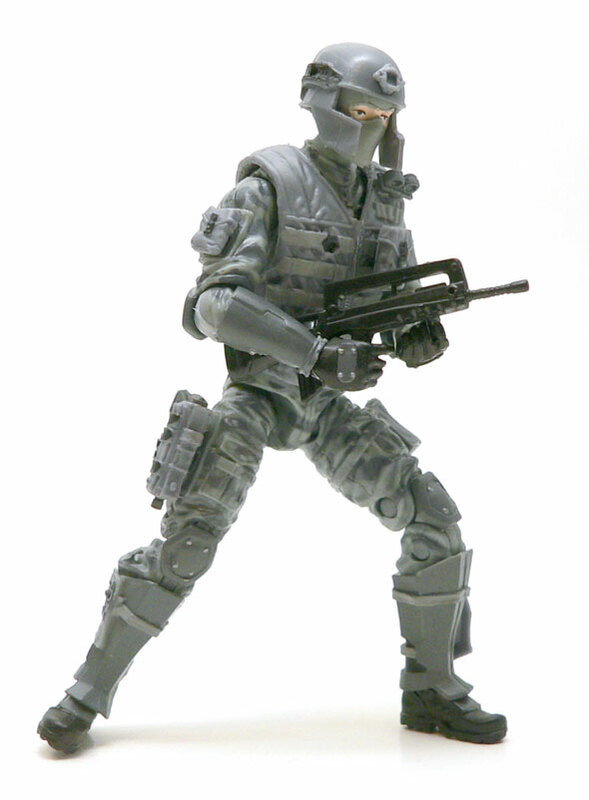 Of course, a Marauder figure comes with weapons. There is a FAMAS Bullpup rifle. It’s a standard rifle for Marauder. The gun looks futuristic enough that the look goes with figure. I will probably swap it out with one of the standard M4’s I have. I suspect the pistol is a bi-metal finish version of their tactical pistol, but not 100% sure. This pistol also comes silencer ready. I love the bimetal look. Speaking of painted weapons, there are two tactical knives. They have brown handles and silver blades. No generic plastic molded knives here! I love the fact they included tiny holes in the handles you could thread a string through for additional mounting options. Now, if he’s holding the rifle, he’ll need somewhere to store those weapons. There are there there holsters included. One left and right plain grey and one tactical. All of the straps are detailed with buckles and black paint. The tactical one is my favorite, but loving seeing the left option here. You could use it in as a center of back right hand draw as well. For the knives there are two sheaths. One tactical and one plain. they look great everywhere I’ve tried them, vest, boot, thight, etc..
One little item Errex helped me figure out was a small double loop. This loop is apparently for storing grenades. I have some Marauder grenades somewhere that I will have to find. Now, you need ammo for all of those guns. And this guy has plenty of storage. There are 2 machine gun two magazine pouches, two small pouches, and two large pouches. The small ones look pretty good on the upper arm. Then there are two pouches that are kind of cool. They are more like open cargo pockets. So if you have little times such as loose mags, you can put them in there. There are two small items I misidentified on my Action Figure Blues Podcast review of this guy. They are actually armor panels one large and one small. Essentially, it looks like they are intended as coverups for some of the open ports. There is one small thing that could be an issue for some folks are the ankles. Because of the armor, the forward bend is a bit limited. It’s not an issue for me, but it is there. You could probably trim it back if you really wanted to. Now, all of these add ons do stick, but if you don’t want them falling off they will need a bit of glue. They were up front about this so I don’t see it as an issue. Overall, I’m really happy. I might have to get a few more and build out a squad. 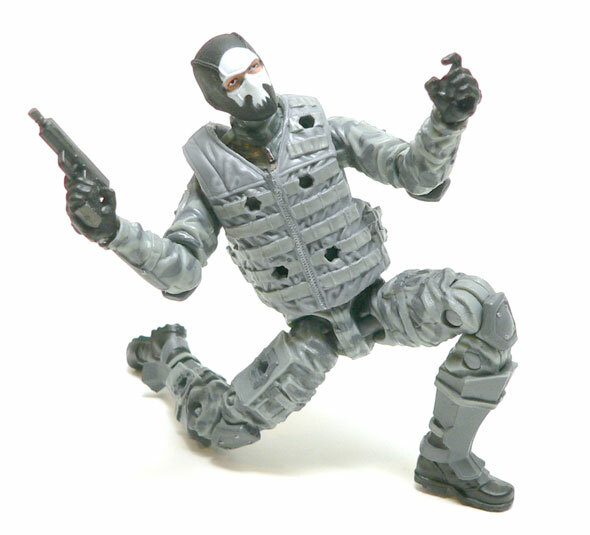 He really reminds me of a couple of my favorite Joe figures, the Pit Trooper and Cobra Shock Trooper. Great basic trooper builders both. However, since there is so much available to customize, making a specific character would be a piece of cake. 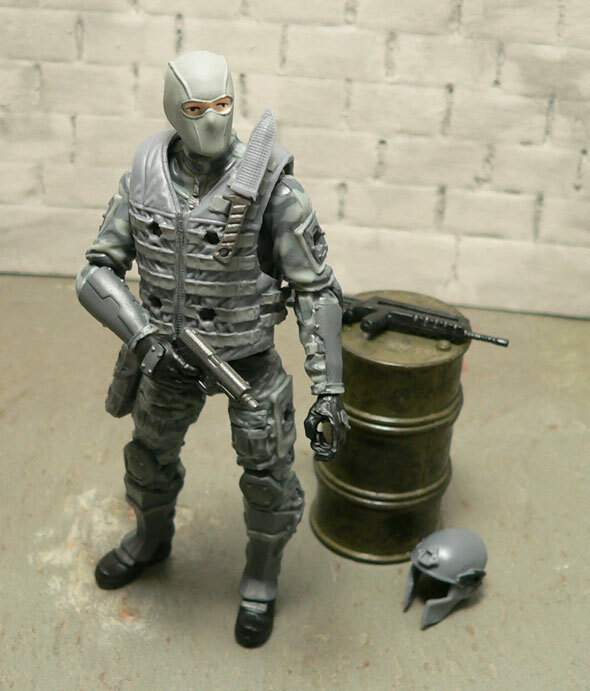 I wanted to get this out there and spread the word about this great figure from Marauder. As such, I really didn’t get to do all the swapping and playing that I wanted. In the next couple weeks, I’ll try and get a gallery of more configurations up over on our Facebook page. This is a very thorough review of a pretty impressive action figure. Love all the customization options on these guys.